Blue In The Night is a Natural material. 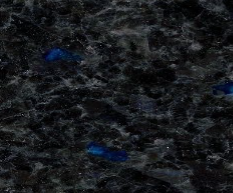 Blue In The Night is a Low priced Granite stone. Blue In The Night is mostly black with vivid blue flecks that run through it. Found in both traditional kitchens and modern kitchens, it truly is a wonder to look at. If on a budget, then please take a look at Angolan Moon which is very similar with smaller blue flecks. If you like the look of this but would prefer lager blue flecks, then please ask one of the sales team to see Volga Blue or Labadorite if we have any in stock. However, both Volga Blue or Labadorite will be more expensive. Blue In The Night is a Natural Granite from Macedonia, Landford Stone offer this type of stone in a variety of thicknesses and finishes. Blue In The Night is a Low priced stone and will look incredible in your home!